Also known as “Cuban pepper”, the Cubanelle is a variety of sweet pepper commonly used in Cuban, Puerto Rican, and Dominican cuisine. Many cooks prefer it to bell types. Sweet Cubanelle peppers can some times be slightly hot, but with only a touch of heat. This 6-8” pepper is prized for its sweet, mild flesh, rich flavor, and pretty colors. The thin-walled pepper is especially suited for quick cooking and has a low water content. Best picked when yellow-green for use in roasting, stuffing, as a pizza topping, for frying, a substitute for Anaheim peppers, or in a yellow mole sauce, and is one of the traditional ingredients in sofrito. They can also be left to mature and harvested when bright orange-red. 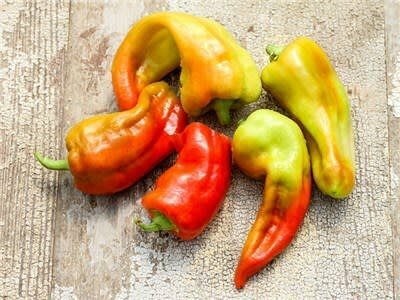 In the garden, in addition to their famed taste and colors, the Cubanelle peppers are also known for their unique, imperfectly curled, wrinkled, and twisted shapes--no two seem to ever be alike.